Orlando is one of the most popular cities to visit in the Sunshine State. This bustling city is home to theme parks including Universal Studios, Universal’s Island of Adventures and the world-famous Walt Disney World. For those wanting to stay in Orlando for more than a few nights, hotels aren’t a very economical option. Instead, a townhome, condo, or villa should be rented for longer stays. This helps visitors to feel more at home and can end up saving money in the long-run. Here is the best way to find homes for rent in Orlando. Ok … questions to ask yourself? Who is going? With my trip, I brought my daughter-in-law’s family which added 2 adults and 3 kids. After you added my wife and I, the total came to 4 adults and 3 kids. Then came the next important question … What dates we will be checking in and checking out? How many nights? This started off as 4 then went to 6 then to 5. And we settled on 5 nights. When you bring more than just your family you will want to ensure everyone is on the same page for dates. Now that we have these basic questions answered we are ready. We need a place that has at least 3 to 4 bedrooms for these dates. That is literally all you need to get started finding a vacation home to rent. 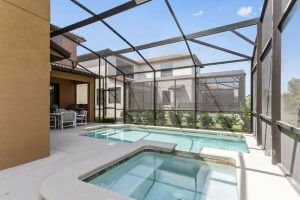 When you’re ready then let us find you the perfect vacation home to rent in Orlando. Not ready yet? Then let me give you the lowdown on filters and sorting. After you do your initial search, the first thing you can do is sort the list. For those who are on a budget you will want to sort by price low to high. For those who price is no object … well you go the other route. Our vacation was in July … and it was hot. Entertainment for 3 grand kids. So you might want to get with everyone to find out what amenities you can live with and what you can live without. But do not forget that a lot of these homes are in resorts that will come a community pool so you still might be able to get a pool, it just might not be private. I wanted a private pool as, honestly, it was a vacation therefore a private pool was a must for me. NOTE: We did end of getting a home with private pool in a resort with a community pool. The only other requirement I had was Wi-Fi … preferably free. Lets review: We have our dates, number of bedrooms and amenities that are must have and would like. The other requirement for us as we were on a budget was how much we could afford per night. With 2 families that meant the cost divided by 2. So we decided how much we would like to spend but then we also came up if we found the perfect place how much we could spend. IMPORTANT NOTE: We did not eat out. We cooked all of our meals at the house so we were able to manage the cost of the trip rather easily as we brought some groceries and bought the rest there. At VillaDirect our search page will give you a property map to show you the different homes location on it including the location of DisneyWorld … everyone loved to see where the home was in reference to it. This was important to my daughter-in-law as she did not want to be very far away from Disney. So with all those factors and the map we were able to find the perfect location … and it ended up being in a resort. BONUS! Honestly we had the best time and the kids loved the pool as they were able to find me every time playing “Marco Polo.” Are you ready to find the perfect home to rent? Look no further, all you need to do is click the button below. I am ready to begin my search for renting a home for my vacation … Great choice by the way.